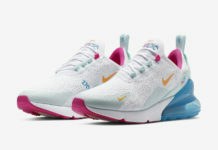 Perfect for the spring season, the Nike Air Max 270 Futura will soon be arriving in a brand new “Spirit Teal” colorway. Constructed in a mix of mesh, textiles and synthetic leather, the shoe features a White base with Wolf Grey overlays. Highlighted the shoe are Teal accents on the Swoosh, lace eyelets and pull tabs atop a Max Air unit in the heel. Check out the official photos below, and look for this Air Max 270 Futura to release in the states very soon at select retailers and Nike.com. The retail price tag is set at $140 USD.